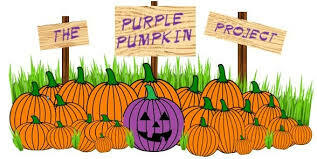 Once again this year we will be painting one of our Halloween pumpkins purple. We are participating in the annual Purple Pumpkin Project. 1 in 26 Americans will be diagnosed with Epilepsy at some point in their life. Epilepsy is also one of the most common neurological diseases in dogs, some studies estimate up to 4% of all dogs are affected. I was diagnosed with idiopathic epilepsy before my 1st birthday. This Halloween, on the eve of Epilepsy Awareness Month, join us & turn one of your pumpkins purple & encourage others to do the same. Strength to your two nephews and newest pup. May they stay strong & seizure free. Two of my nephews have seizures and now my newest pup has been diagnosed with idiopathic epilepsy. We posted our purple pumpkin earlier this week in support of the work The Epilepsy Foundation does. I hope I live long enough to see this condition eradicated.